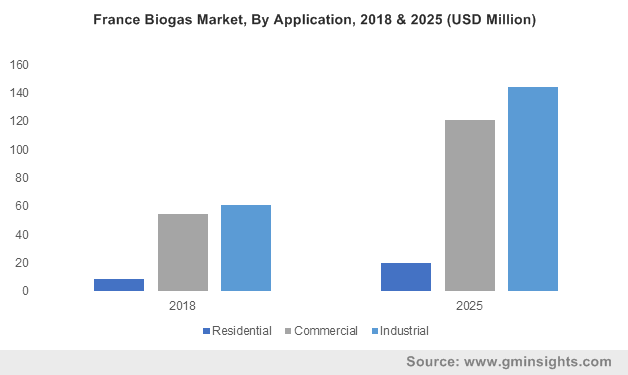 Europe Biogas Market size in 2018, was over USD 3 billion and annual capacity addition is anticipated to exceed 1 GW by 2025. Shifting trends toward utilization of clean energy resources coupled with aims to achieve energy diversity will drive the market size. Respective governments across the EU are focusing toward reducing dependence on the fossil fuel imports which will further enhance the business growth. For instance, the EU imported over 180 billion cubic meters of natural gas from Russia in 2017. Favorable government initiatives toward utilization of renewable energy resources will stimulate the Europe biogas market growth. Stability and reliability of support schemes across key economies in the region has led to an increased production of biogas. Countries across the region have announced nationally determined targets toward clean fuel adoption which will further complement the business landscape. 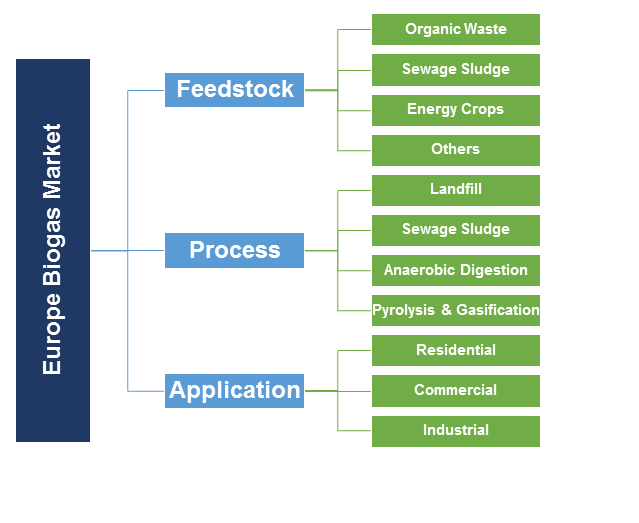 Europe organic waste biogas market is set to witness gains over 14% by 2025. Organic waste includes food waste, paper waste, slaughterhouse waste and other biodegradable waste generated from the various sources. Rising waste generation from urban centers coupled with shifting trends toward resource recovery will propel the industry growth in coming years. 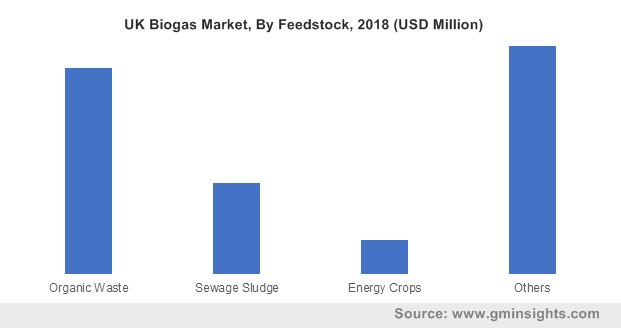 Energy crops based biogas market was valued over USD 1 billion in 2018. Maize is one of the most prominent feedstocks which is utilized for the generation of electricity and heat from the biogas plants. Reduced investment and high energy density are some of the prominent features which make energy crops as one of the most favorable resources for the biogas production. Anaerobic Digestion (AD), in 2018, accounted for over 70% of the Europe biogas market revenue. The process involves production of biogas in anaerobic digesters through the fermentation of agricultural waste, energy crops and manure. Introduction of renewable energy directives and favorable schemes has resulted in growing installation of AD based biogas plants. Electricity generation from landfill will grow on account of rising efforts to mitigate the negative impact of greenhouse gas emissions favored by government measures to trap non-conventional energy resources. Landfills are utilized to decompose organic waste for the production of landfill gas which is composed of nearly 45% methane. It offers comparatively lower cost of biogas production when compared to other available alternatives which will further stimulate the industry growth. Increasing focus toward reducing carbon footprint coupled with growing demand for on-site electricity generation will drive the industrial biogas market size. Resurgent economic growth across key European economies along with availability of cheap feedstock will further fuel the deployment of biogas plants across industrial centers. Europe commercial biogas market is anticipated to witness growth of over 10% by 2025. Growing need for the reliable and cost effective waste treatment technologies along with rising popularity of CHP systems are some of the key underlying factors which will stimulate the industry growth in coming years. Germany biogas market is set to witness strong growth on account of supportive regulatory schemes toward utilization of biogas for electricity production. In 2017, the government of Germany introduced Renewable Energy Sources Act which aims toward prioritizing renewable based electricity generation. Easy availability of feed stock coupled with declining cost of biogas production technologies will further enhance the industry growth. The UK biogas market is set to witness growth of over 10% by 2025. Ongoing shift toward green economy in conjunction with rising investments toward waste recycling and energy recovery will fuel the industry growth. Government supported investment programs and feed-in-tariff schemes will further enhance the business landscape in coming years. Key market participants include EnviTec Biogas, Scandinavian Biogas Fuels International, Agrinz Technologies, Viessmann Group, Weltec Biopower, Agraferm Technologies AG, BDI - Bioenergy International GmbH, Gasum, PlanET Biogas Global, Xergi, AB Holding and Engie. Strategic business-led collaborations and mergers & acquisitions are some of the significant initiatives undertaken by the key industry participants. Furthermore, the companies are also engaged in extensive research & development to gain competitive edge over other participants. Biogas is a renewable energy gas resource comprising methane and carbon dioxide. It is produced from the anerobic digestion using microorganisms and from the decomposition of organic waste. It is used as a fuel for the electricity generation and also utilized to produce heat for the space heating and cooking applications.